Valworx 552903 stainless steel full port three way ball valves are designed for use with water, air, oil, and other media compatible with the materials of construction. 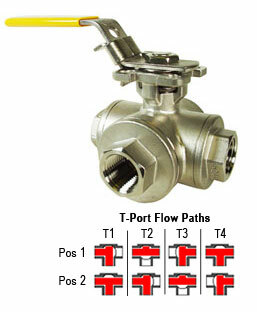 Valves can be set-up in any one of four different flow patterns (T1-T4) in the field by simply moving the valve stem and handle (factory setup T2 flow pattern). 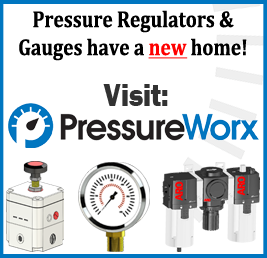 These valves require low operating torque and feature a quarter turn latch-locking handle. Removing handle allows for easy mounting of electric or pneumatic actuators with the industry standard ISO5211 direct mounting pad. This insures precision shaft alignment and eliminates the need for additional brackets and couplings. Triple stem seal design is live-loaded and self-adjusting, compensating for wear, pressure, and temperature fluctuations. All valves are tested per API 598.